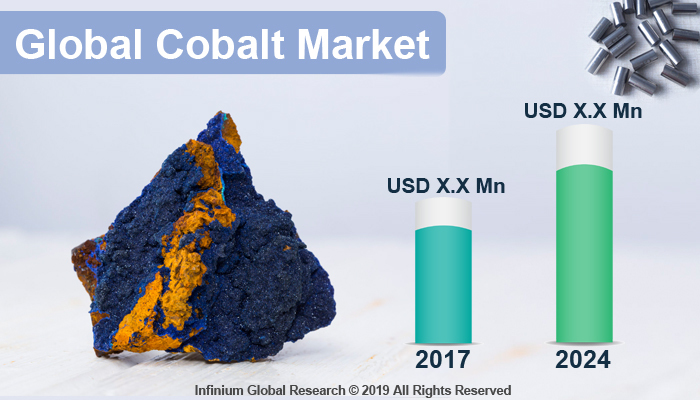 A recent report published by Infinium Global Research on cobalt market provides in-depth analysis of segments and sub-segments in the global as well as regional cobalt market. The study also highlights the impact of drivers, restraints, and macro indicators on the global and regional cobalt market over the short term as well as long term. The report is a comprehensive presentation of trends, forecast and dollar values of global cobalt market. According to the report, the global cobalt market is projected to grow at a healthy CAGR over the forecast period of 2018-2024. Cobalt is the chemical element with atomic number 27. On the periodic table, cobalt can originate among the d-block elements, transition metals. Cobalt has high melting and boiling points that helps to retain its strength at high temperatures. Cobalt is recovered as a byproduct of mining and refining of nickel, silver, led, copper and iron. Cobalt is an important technology enabling metal that is vastly used in the various application where energy storage, high-temperature resilience, hardness, and process efficiency are required. Cobalt is used for a number of industrial and biological applications. According to the Cobalt Institute, around 50% of the cobalt produced globally is found in rechargeable batteries. Cobalt with its components plays a vital role in the construction of lithium-ion batteries. The growing use of lithium-ion batteries in the in several applications are driving the growth cobalt market. In the integrated circuits, the cobalt is used as contacts that connect different components of an integrated circuit owing to its unique physicochemical properties. Thus, this factor is contributing to the growth of the cobalt market Furthermore, copper is being replaced by the cobalt in the integrated circuits that anticipated to boost the growth of the cobalt market. Cobalt is a bio-essential element due to its location at the center of vitamin B12. According to Cobalt Institute, Vitamin B12 plays a number of vital roles in the physiology of the human body. Cobalt is also important in treatments of radiotherapy. In addition, cobalt is also used in the detection of tumors and metastases, sterilization of surgical equipment and the imaging of damage to the brain. The various biomedical applications contribute to the growth of the cobalt market. However, a wide number of human health, environmental, trade, and energy regulations on the use of cobalt are hampering the growth of the cobalt market. Additionally, Semiconductor equipment vendor is taking the initiative to use the cobalt in the semiconductor manufacturing. The growing awareness about sustainable and renewable energy is also helping to create more growth opportunities in the cobalt market in upcoming years. Regionally, Asia Pacific holds the maximum market share in the cobalt market. It is also and fastest growing region in this market. The rapidly growing consumer electronics and automotive industries in the Asia Pacific creates a huge demand for the cobalt. Thus, these factors are driving the growth of the cobalt market in the Asia Pacific region. In addition, increasing applications of cobalt in the Oil & Gas, Chemical, Construction, and transport are contributing to the growth of the cobalt market in this region. Additionally, the growing use of cobalt in semiconductor manufacturing is fueling the growth of this market in the Asia Pacific region. The report on global cobalt market covers segments such as application, and end user. On the basis of application, the sub-markets include alloys, batteries, catalysts, pigments and coloring, radioisotopes, and other uses. On the basis of the end user, the sub-markets include oil& gas, chemical, automotive, pharmaceuticals, aerospace & defense, healthcare, electronics, construction, and transportation. The report provides profiles of the companies in the market such as Glencore, Fleurette Group, Vale S.A., Gecamines, China Molybdenum Co., Ltd., Jinchuan Nonferrous Metals Corp., Eurasian Resources Group, Huayou Cobalt Co., Ltd., Jiangsu Cobalt Nickel Metal Co., Shenzhen Green Eco-manufacture Hi-tech Co., Ltd., and Sumitomo Metal Mining Co.. The report provides deep insights into the demand forecasts, market trends, and micro and macro indicators. In addition, this report provides insights into the factors that are driving and restraining the growth in this market. Moreover, The IGR-Growth Matrix analysis given in the report brings an insight into the investment areas that existing or new market players can consider. The report provides insights into the market using analytical tools such as Porter's five forces analysis and DRO analysis of the cobalt market. Moreover, the study highlights current market trends and provides forecast from 2018-2024. We also have highlighted future trends in the market that will affect the demand during the forecast period. Moreover, the competitive analysis given in each regional market brings an insight into the market share of the leading players.